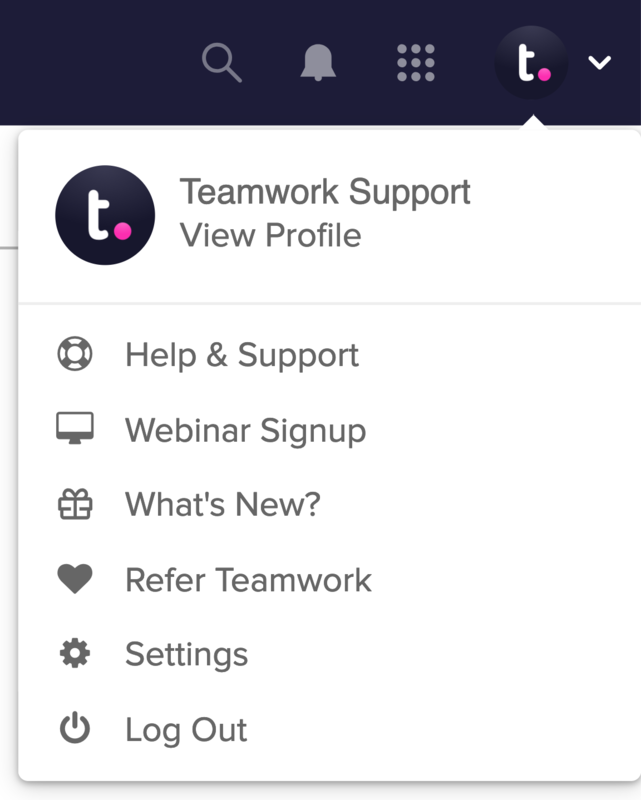 Within Teamwork Desk you will see the Desk navigation bar running along the top of the screen regardless of what page you are on. This is the area you will use to navigate the various areas of Teamwork Desk. Dashboard - The Dashboard gives you access to inboxes, activity and metrics. Tickets - A list of the tickets you have received to your inbox or inboxes. Help Docs - All help articles you have created for your customers. Customers - Lists all customers who have contacted you, as well as any companies you have created. Reports - The reports section is designed to give you an indication of the performance and volume of your tickets. Search - Within this you can enter a term which will search tickets, customers and help docs. Chat - You can select the speech bubble icon to open up Teamwork Chat. You will first have an option to select a user or search and once chosen, Teamwork Chat will open. Notification Bell - You can easily keep up to date with your tickets, notes, happiness ratings or your team's activity, to mention a few, by using the notification bell. Product Switcher - If you have enabled other Teamwork products such as Teamwork Projects or Teamwork Chat you can quickly switch between these by choosing this option. Profile Icon - By selecting your profile icon to the far right you will have access to the areas below. View Profile - View your profile and edit details. Help & Support - A link to the Teamwork Desk support pages. Webinar Signup - Sign up for a live Teamwork Desk webinar with one of our experts. What's New? - A list of recent updates made to Teamwork Desk. Refer Teamwork - access your referral program history. Settings - Gives you access to all settings within Teamwork Desk. Log Out - Log out of your Teamwork Desk session.